Tabbouleh can be spelled: Tabouli, Taboule, Taboli, Tabouleh and probably many more ways. Although no one knows the exact date when tabbouleh first came on the scene, it was probably several thousand years ago. We do know that bulgur wheat is enjoyed as food approximately for 4,000 years. Tabouli salad is considered the ideal food of the Mediterranean diet. Tabbouleh is often served as an appetizer, a salad, or a side dish. It goes well with hummus or falafel. Add bulgur and sea salt to boiling water. Simmer for 10 minutes. Turn off the flame and let it cool off under tight cover. Bake the whole red pepper. Remove skin and seeds, and cut into small pieces. Combine cool bulgur, chopped veggies and dressing. Enjoy! Leftovers could be kept in the fridge for the next day. This looks great! 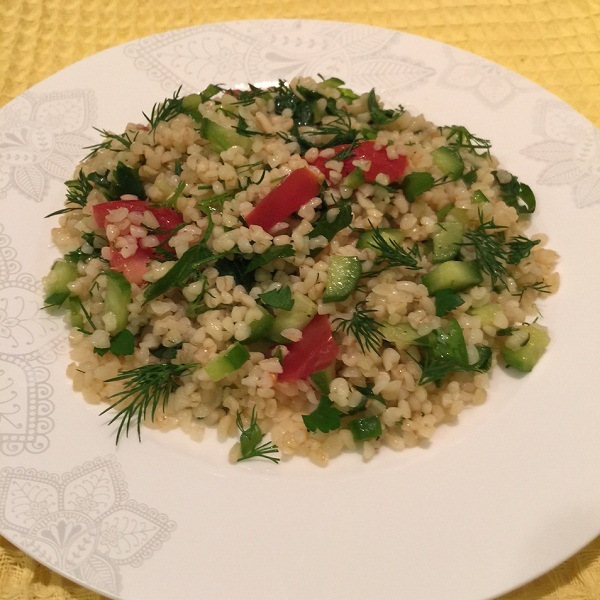 What would you substitute in place of bulgur for a gluten free option? Thank you. I am sorry Michla, it took me so much time to reply to you. Buckwheat or quinoa would be the tasty and gluten free substitution.